We all have a Divine Blueprint. just like a beautiful temple is first drawn on a blueprint, so too does our soul have a blueprint. This Blueprint consists of the lessons we wish to learn, the things we wish to experience, the growth we hope to accomplish. And if we do not learn those things we had planned, than we can return to do so in another life, much like a grand cathedral is built over many lives. When we are connected to our hearts, it becomes easier to follow our soul’s path. This angel is therefore here to remind us of our Divine Blueprint and to follow our heart to live according to our higher plan. The sculpture seemed to make itself after I picked up a high frequency blue Kunzite Crystal at a gemstoneshop here in the Netherlands. Kyanite is a beautiful and metaphysically powerful stone claimed to have high vibrations. Kyanite aligns the chakras and meridians (seven main energetic points in the body) just by holding it and is associated with the third eye (between the eyebrows). It restored Qi and the original DNA. It reveals one’s path in life and helps with meditation. Like a key, it can unlock doors and reveal psychic gifts or allow one to go deeper creatively or metaphysically; even revealing karmic plans and outcomes. It also connects you to your spirit guides and helps to work through karmic patterns. It can be used to heal past relationships and bring love to current or future connections. Since it can align chakras quickly, it provides emotional balance; eliminating worry and confusion. It will also aid communication and reduce disagreements. “I Am the Angel of the Divine Blueprint and I am here to help remind you of your inner spark of Light. You are a Divine being in a human experience en you may now align that experience with your Soul, the truth of who you really are. Please realize there are no mistakes. Every choice brings lessons and growth. Yet you came to this beautiful planet with a plan and the more you attune to the deeper truth of your heart, the easier it becomes to live according to your Divine Blueprint. You can meditate whilst looking at this angel and also work with your Divine Blueprint by caling in Archangel Michael or using his essence. 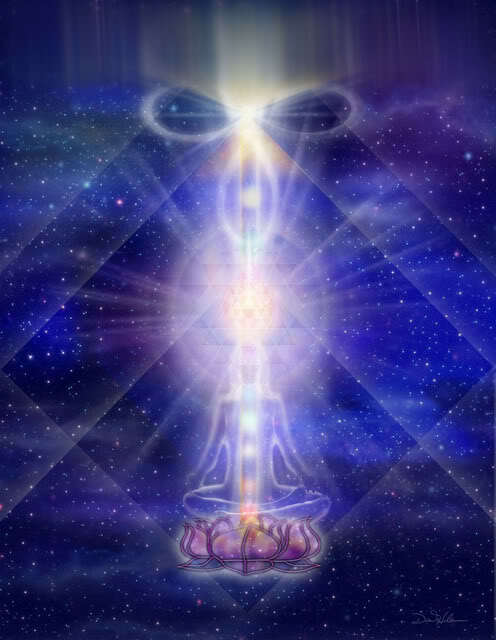 This entry was posted in Angel Art, Angel Blog Article and tagged angel, divine blueprint, DNA, healing heart angel on February 20, 2015 by Angel Light Heart. This afternoon I was sculpting an angel for a couple who suddenly lost their teenage daughter. As always when making my Healing Heart Angels I tune into the Angels and this time I was focused on the Angels who comfort in grief, such as Archangel Azrael and the Angels of the Rainbow Bridge. Just as I was finishing the angel, news was broadcasted on Dutch radio that Prince Friso had died today. Every day, new souls are born on earth in a human body. And at the same time souls leave the planet on a daily bases. Every person has to deal with the grief associated with the ebb and flow of life. We all walk the earth for a certain time. Sometimes we walk together during our whole lives. In other instances life paths cross for a brief time. At some point we all have to say goodbye until the time we will be reunited in the Afterlife or next life on Earth. The Angels comfort us because they know goodbye is not forever. Shared love is eternal. You keep this fire burning in your heart for as long as you live, after which there you meet again Soul to Soul. When my father was dying, tears streamed down his cheeks. He did not understand why his body was crying. He had never been a man who showed his emotions. But his body and soul obviously thought better of it. My sadness at losing him was devastating to him. His main concern was leaving his children behind. I comforted him by saying that the degree of sadness when grieving is in direct proportion to the degree of love that was shared. I had never wanted to miss out on that! After my dad died I made my first Healing Heart Angel to comfort myself and remind me that our love was eternal and he was protected by angels. When we mourn, the Angels come to comfort us. You can call on Archangel Azrael, the Angel of Consolation and the Angels of the Rainbow Bridge to assist you during the difficult time after a loss. You can also call on them to assist other people who are grieving. As such we can be there for each other as human angels on earth. In times of grief, we can be there for others. Simply by being there. By a supportive word or card, a visit or phone call. You cannot take away the pain, but you can give the other person the strength to bear the loss. Personally, I always ask the Angels to help and support those who have lost a loved one. I have created the Rainbow Bridge essence with my colleague Sabine to support people during any time of transition. 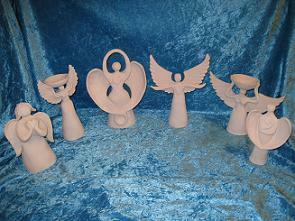 And as mentioned above I share the peace and strength of the Angels through the sculptures I make. 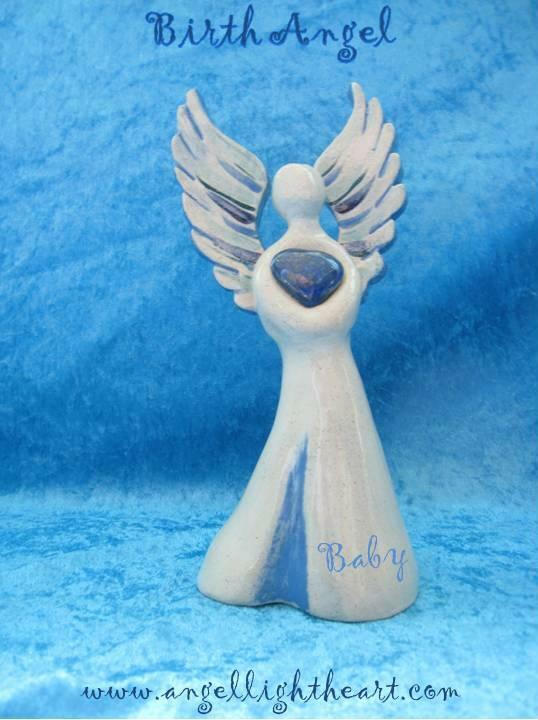 Would you like a tangible reminder of the fact that your loved one is with the Angels and you are never alone? Or would you like to give this as a gift to someone who is in mourning? 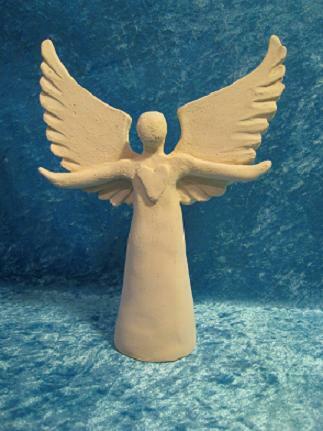 Feel free to contact me about making a comforting Healing Heart Angel to support you or your loved one. Finally, the connection with the Angels can be strengthened by receiving a treatment with Angelic Reiki as a healing gift to yourself or another. 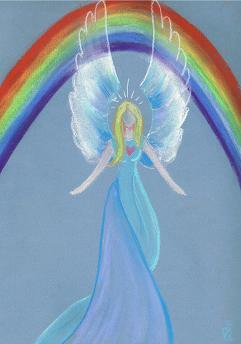 This entry was posted in Angel Art, Angel Blog Article, Angel Healing and tagged Afterlife, angel, archangel azrael, crystal angel essences, Grief, Grief Loss and Bereavement, healing heart angel, Rainbow Brigde on August 12, 2013 by Angel Light Heart. 2013 Year of the Watersnake, welcomed by the new moon. who will be the guiding energetic influence over 2013. Not for 60 years has Water Snake graced us with her presence. is, after all, a symbol of healing, rebirth and regeneration. waters, then go with the flow. May you glide gracefully through your year. 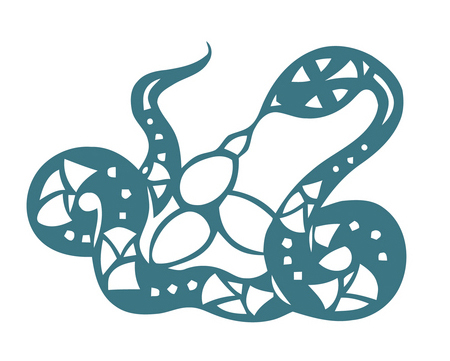 I have found the first month of 2013 quite intense and cannot wait to work with the energy of the Water Snake. It will certainly help me in my creative and intuitive work with the angels through my sculptures and readings! Each year the start of the Chinese New Year comes together with the New Moon. What a great way to start the new year ahead as the new moon is all about setting new intentions, starting new projects and the like. A great time to meditate on these themes. This is the case for each new moon, but extra strong for todays full moon! I wish all my blog readers a year filled with creative flow, wisdom, enhanced spirituality and friendship! This entry was posted in Angel Art, Moon Meditation and tagged 2013, healing heart angels, new moon, year of the snake on February 10, 2013 by Angel Light Heart. Since the last decades, many special children have been born. They bring beautiful and powerful qualities to the world, though they can be a challenge for adults. Thankfully many of these special children are being born to sensitive parents and grandparents, such as highly sensitive people, light workers and healers. They are here to add their own colour to the tapestry of life. 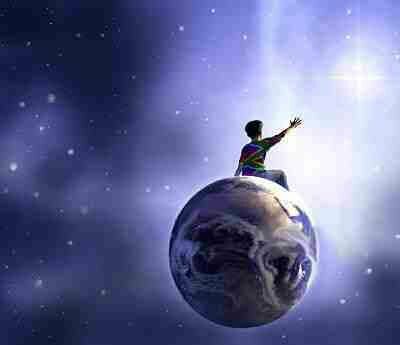 Some speak of indigo children and adults, rainbow children and crystal children. Though these terms give insight in the end each and every one born on this Earth is special and should be welcomed into this life. A dear friend of mine is pregnant. As she participated in the Angelic Reiki Retreat here in the Netherlands, she was very unwell at times. I felt a deep respect for her perseverance. She felt she needed to be there very deeply. Not only for herself but more so for her unborn child. I usually work with (young) adults and am not used to being attuned to small children, but this unborn girl connected with me directly. Last week I treated mother and unborn daughter with distant Angelic Reiki. I was amazed at how easy it was to connect to the soul of this being. She radiated golden and pink light and there was such gentleness in this powerful light. This week I had the flu and my friend sent me a healing with Angelic Reiki in return. And funnily the little girls was present immediately. She let me know she had gotten the attunements herself even though she is still in her mothers womb. How amazing. No wonder it had been so heavy on her mum as she got all the attunements two-in-one. This little girl will be named after a star and her connection to the stars was evident when I connected with her. The same is true for many souls. Our souls come from many different places, bringing their own vibration to Earth. Everyone brings special qualities and comes to learn and create unique things. And no matter where our soul is from, we all are born with a guardian angel with us to keep track of our soul mission and to support us through it all. There is more help available then we may be aware of. For those wishing to welcome a baby to Earth (or celebrate an inner rebirth and the inner child) I am now creating Birth Angels sculptures. 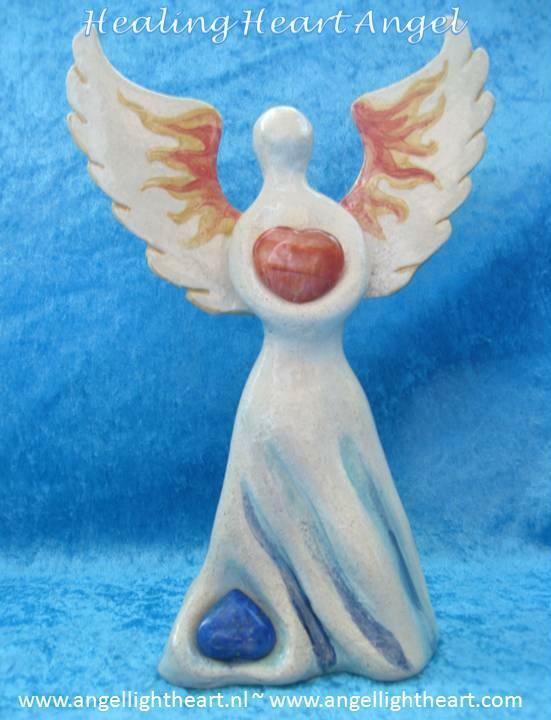 This variant of the Healing Heart Angels holds a childlike energy. The gemstone heart is connected to the astrological sign of the (inner) child receiving it. 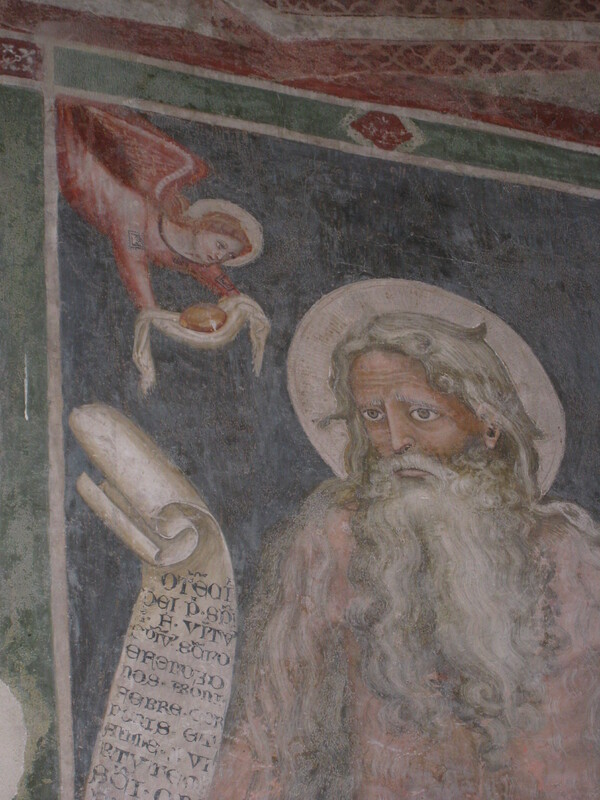 The colours of the glaze also are in tune with the zodiac sign and the name of the child is painted on the angel. You can order them from the Angels & Co webshop. This entry was posted in Angel Art, Angel Blog Article and tagged astrological angel, birth angel, crystal children, Guardian angel, healing heart angel, Indigo children, Netherlands, star children on January 26, 2013 by Angel Light Heart. 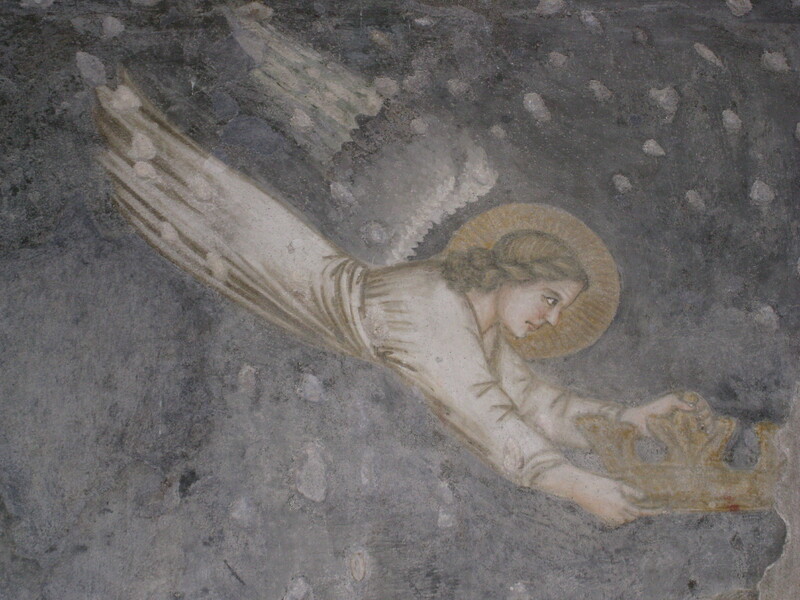 After sharing the angels in Strasbourg with you and the magnificent gift of Archangel Michael in the little church in Volterra, I would like to share some of the many other angels I saw in Italy. When you love angels and/or work with them like I do, seeing angel art is always inspirational. 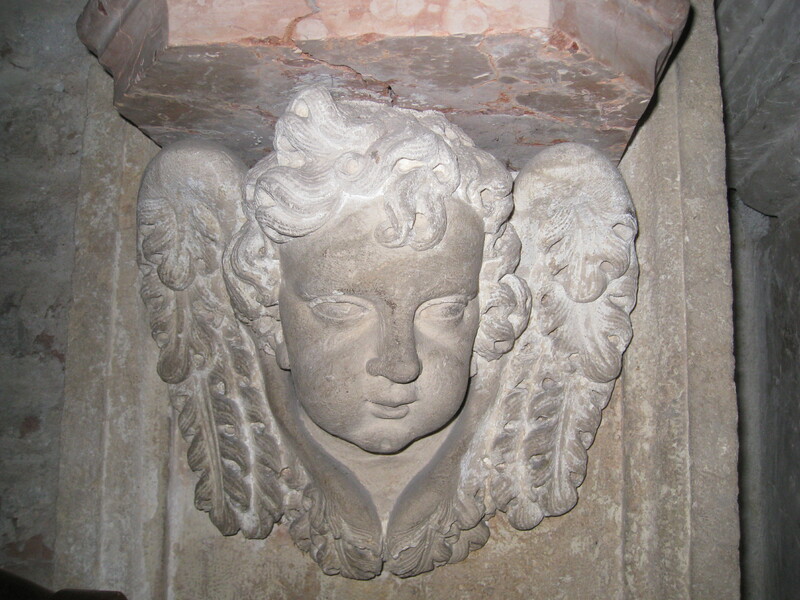 So when I am on holiay I always like looking for angels in churches and cathedrals. Though angels in art are always an interpretation of the artist, enjoying angel art will surely connect you to the angels. Enjoying angel art, helps you align to a higher frequency and that will bring you closer to the angels. In my experience, making and seeing angel art eases the process of tuning into the angels. 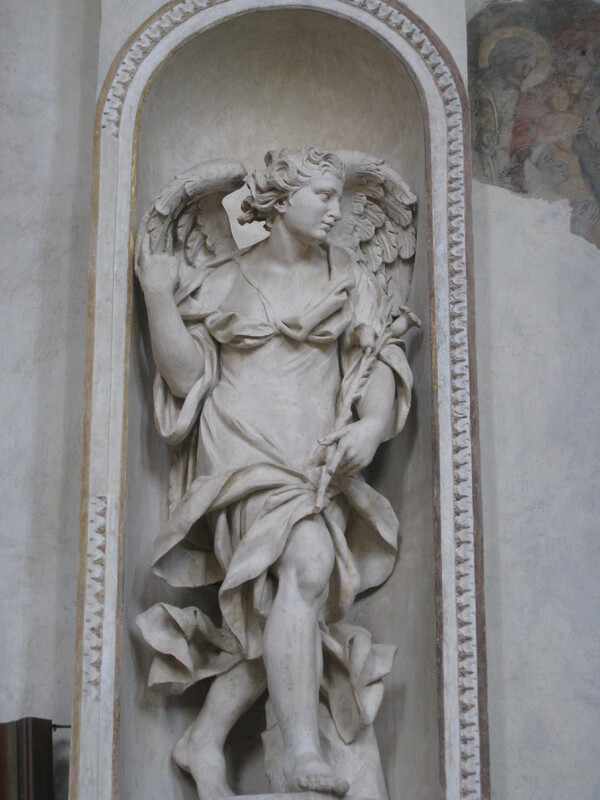 So, come on a little angel journey with me and enjoy the Italian art. Perhaps it will help you feel in a better state of being which in turn will bring you closer to the angels. 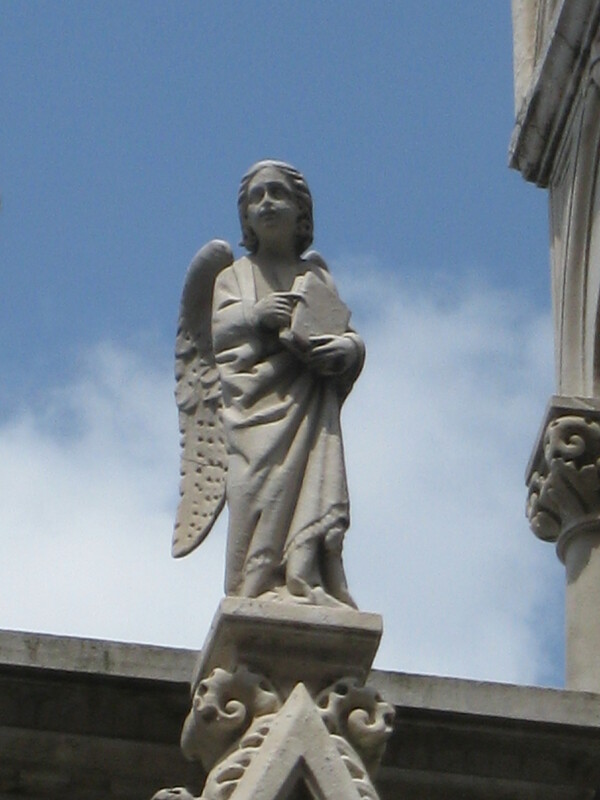 An angel brings inspiration in Verona . There are many more angels to share, but the blog will not let me. so we will make do with these ones for now. Ofcourse you can also find angel art to fill your own living space. Feel free to browse my galleries at www.faeryqueen-healingart.co.uk, www.engelentherapiecoach.nl and www.heart-healingart.nl. 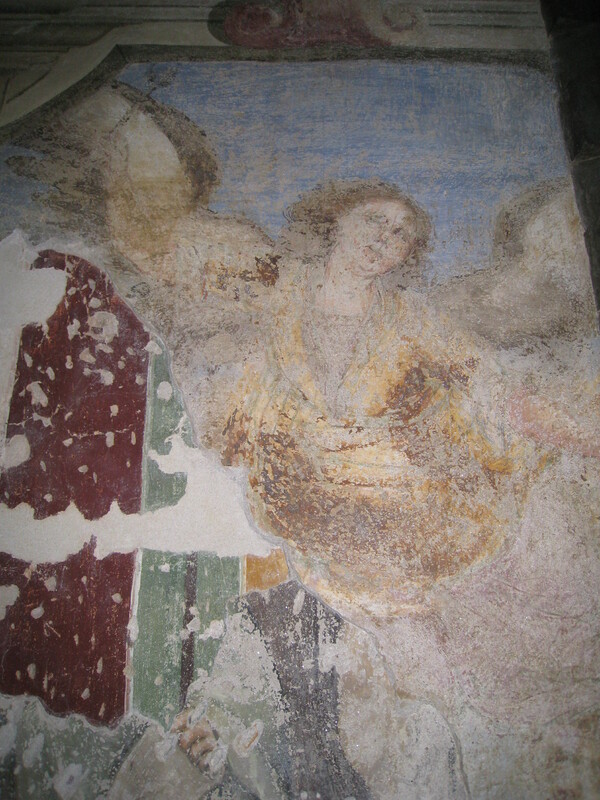 This entry was posted in Angel Art and tagged angel art, angel fresco''s, angel sculptures, angel spotting, archangel gabriel, Gabriel, Italy, Michael (archangel), Santa Maria della Spina, Strasbourg, volterra on June 27, 2011 by Angel Light Heart. 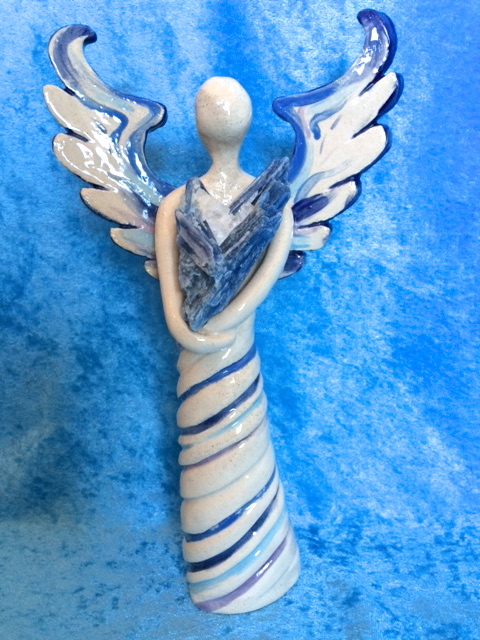 A unique one of a kind angel made in spiritual alignment to what you need in your life. 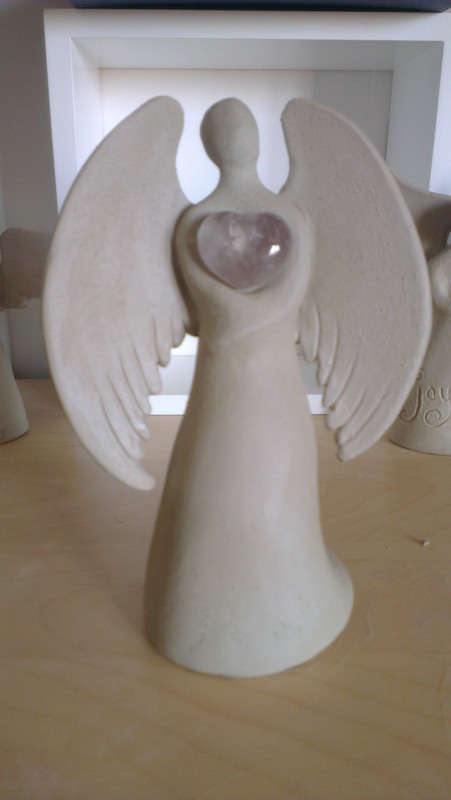 I made the first Healing Heart Angel for myself in 2005 in response to losing my dad to cancer. 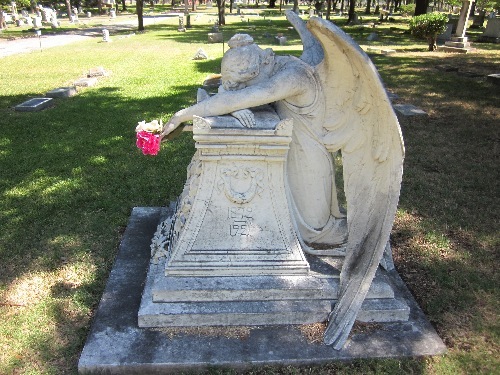 My heart definitely needed healing and the angel sculpture helped me in the process of grief. Since 2010 I have started making more Healing Heart Angels, especially for clients who either need healing or like an angel to help them on their spiritual path. A sculpture for healing and spiritual growth. The person who orders the angel, tells me what he or she wants the angel to portray. For instance, I had one lady and a young man who wanted an angel to help remind them to love herself. Another lady has asked for an angel to welcome her grandson into the world and yet another wanted one to bring protection to her ill son. There have been healing heart angels for self love, love, strength, a soul mate relationship and to strengthen the connection to the higher Self. You can decide for yourself what it is you need in your life to become whole and happy. The process of making the angel especially for you. Once I received the information about what the angel should help with, it is easiest when I have a picture of the person at hand. 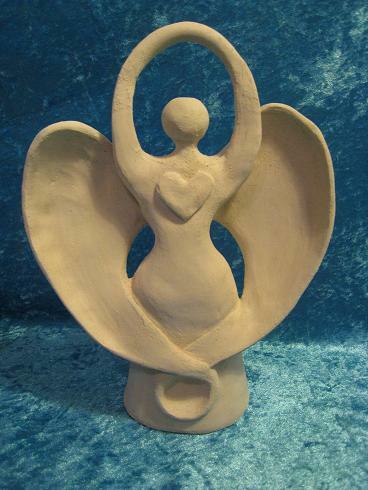 Before starting the sculpture I meditate, ask my Higher Self and guardian angel to connect to that of the other person. Sometimes a symbol comes to mind, such as with the person who needed to be reminded to love herself. I saw a double heart. And later on she was amazed as she used that symbol in her meditation. If nothing at all comes up I pick an angel card for inspiration. Usually during the process of sculpting little messages for the person come through, which I write down and send together with the angel. Before drying I infuse the sculpture with some angel aura spray. Then it needs to dry three weeks. Depending on how many artworks are drying it takes some time to fill the kiln completely. It fires between 900 and a 1000 degrees Celsius and then before sending it, I attune it to Angelic Reiki. Current prices can be found on my website http://www.faeryqueen-healingart.co.uk. Feel free to contact me there or through this blog. I always love making Healing Heart Angels for spiritually minded people! 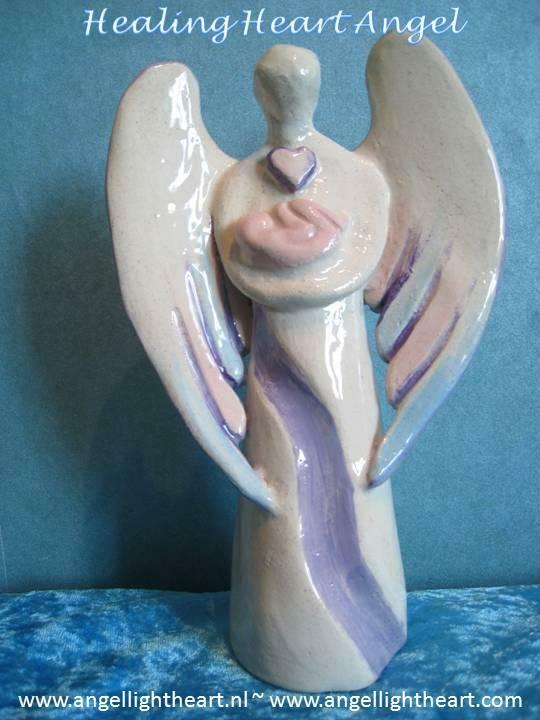 This entry was posted in Angel Art and tagged Angel Healing, angel of self love, angel sculpture, angel statue, healing heart angels, infinity angel on January 26, 2011 by Angel Light Heart. In 2005 my dear father died of cancer. He had bravely battled it for 4,5 years and then it was time for his wonderful spirit to move on to another life, beyond this earthly one. I was in deep mourning. Every morning I would wake up feeling a wave of sadness and even despair wash over me as soon as I realized my dad, my supporter, my friend was no longer with me. A few days after his passing my husband had to travel overseas and as I did not want to be alone I stayed at my mum’s place in the eastern part of the Netherlands. She and my dad had divorced many years before and so she could be there for me from a place of calm. One of those days she was to go to her ceramics class. I had done ceramics and sculpting with clay for many years as a teenager and so I went along and was allowed to sit in. I took some clay and made an angel for my dad. My brother had said to me, losing dad was like someone had ripped out his heart and that is was hanging from his chest by a thread. I felt much the same and that is why I made an angel holding a heart. It was my first ever healing heart angel. Years later I started a spiritual and creative business. I used some of my dad’s money to get myself a real kiln and made many sculptures. Part of my service was to make sculptures on a commission basis and the first lady who did this, had seen my meditation videos on youtube and had seen the healing heart angel. As she too had lost her dad, she felt a connection to it and wanted one of her own. She wanted it to help her remind herself to love herself. And so I meditated upon it and asked spirit to lead the way with the sculpture. And sure enough, as I was making the heart, a voice inside my mind (it does not sound like a voice, but more like a higher thought, an inspiration) told me it needed to be a double heart. One to signify her loving nature towards others and another to remind her she needed to love herself first. I sent her a photo of the angel (as it takes weeks to dry, I always like giving my clients a sneak preview to allow them to follow the process). She was amazed as she always used the symbol of the double heart in her meditations. The day she finally received the angel, she got a very special phone call. Her son who had been out of touch for 14 months, finally reached out to his mother again. She was overwhelmed. The angels work in wonderful ways! Since then my main focus of work has been to make healing heart angels. I have made them for people who want them as a reminder to love themselves, as a reminder to stay connect to spirit and Higher Self, as a symbol for soul mate love, fr strength and love, to welcome a newborn child into the world and to protect the sick. Each angel is a blessing to make. You can read more about the process on my website: http://www.faeryqueen-healingart.co.uk. Feel free to browse the gallery and if you have any questions, do not hesitate to send me a message through this blog or my site. 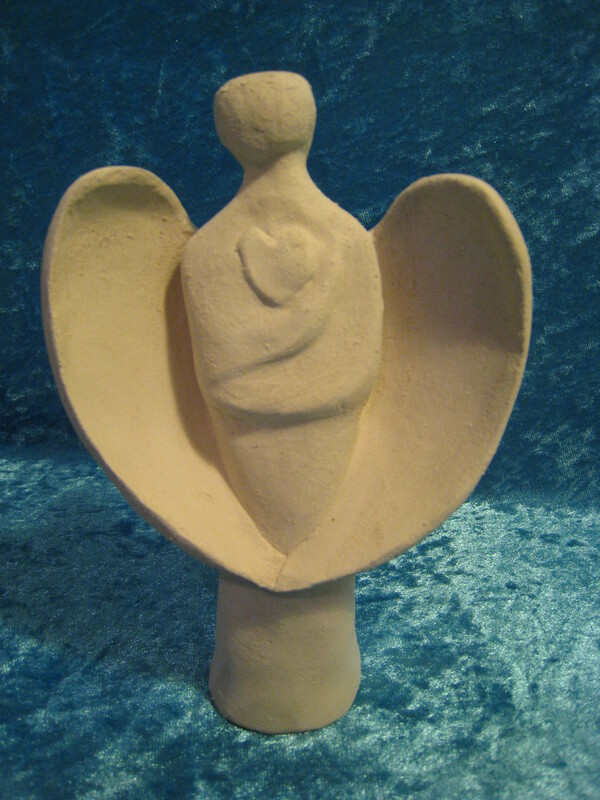 This entry was posted in Angel Art and tagged angel art, angel coach, angel sculpture, angel statue, art, healing art, healing heart angels on January 26, 2011 by Angel Light Heart. Co-author of 365 Days of Angel Prayers, Get your copy now!